the damages. It is wise to check the cartons while the carrier's driver is present, during delivery; it only takes a minute to see if there was any breakage. Get the driver to record the breakage/damage. Once damages have been noted by the carrier, the purchaser is to contact JungWines Shipping by email and report the loss. JungWines will replace the damaged goods at no charge to the purchaser once the carrier confirms that the goods were damaged; under no circumstances should the purchaser initiate any Claim Filing with FedEx (this will be done by our shipper). FedEx can only reimburse the authorized shipper account. When emailing JungWines Shipping, please supply the ORDER NUMBER that was recorded on the order form sent to the purchaser by PsiGate.com at the time of purchase, also include a description of the damage/loss � complete, partial, etc. 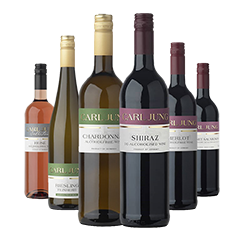 If a shipment is to be cancelled before it has been shipped email JungWines requesting cancellation by JungWines prior to notification of your product being shipped. . The restocking charge will be .00 unless the order was 3 or fewer bottles then the restocking fee will be .00. JungWines will confirm the cancellation. If however the wine has been shipped the Return Policy below applies. If a shipment is to be returned then email JungWines requesting a return number from JungWines. Please supply the ORDER NUMBER that was recorded on the order form sent to the purchaser by PsiGate.com at the time of purchase. Once you have received a return number you may return the shipment. In general all shipping, handling & internet charges will be deducted from the refund. This refund will be based on the total number of bottles returned to JungWines. Please remember that a return number must be received by the purchaser before any wine is returned to JungWines.